If you think that all relics of English saints were destroyed during the English Reformation during Henry VIII’s reign or the English Civil War and subsequent Commonwealth of the mid 17th century, think again. It is well-known that the relics of St Edward the Confessor remained in place in his Westminster Abbey shrine. Somehow, the relics of the ninth century St Wite can still be found at Whitchurch Canonicorum, near Bridport in west Dorset. 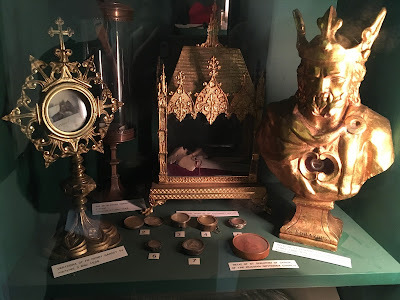 At the weekend, I also found that since the 1920s, there has been a collection of four major English relics and numerous locket reliquaries in Roman Catholic church dedicated to St Edward the Confessor at Sutton Green, near Guildford in Surrey. And it’s a story which has mystery attached. The tale is told in the church's booklet: "the four major relics were found behind panelling at Sutton Place in a room thought to have been used by priests. There were in a small iron-bound trunk covered with embossed leather. The very faded parchment labels identified them as the bones of St William of York, St Cuthbert Mayne, Blessed Robert Sutton and Fr Henry Garnet." (p.9) No date is given for their discovery. Sutton Place is a large private estate, once owned by J. Paul Getty, and portrayed in the recent film, All the Money in the World. It was the site of a royal hunting lodge as far back as the late Anglo-Saxon period when it is believed to have been used by King Edward, who became known later as ‘the Confessor’. Only St William of York's relic (a shoulder blade) may have been at Sutton Place by the early Tudor era. He died in 1154. His cult had little support outside the archdiocese of York and it is of interest how this relic made its way south to Surrey. Born in Boston, Lincolnshire, Sir Richard Weston was a senior courtier to Henry VIII and was granted the Sutton Place estate by the king who made a state visit there in 1533. Despite his son Sir Francis being beheaded for a relationship with Anne Boleyn, he retained his place as a close adviser to the king including the appointment to meet Henry’s fourth wife Anne of Cleves on her arrival from Germany in 1539. He died in 1542 and was succeeded by his six-year-old grandson Henry. It is speculation but Dorothy Arundell (a Catholic family) married Sir Henry Weston in 1559 and may have been given the relic of Cuthbert Mayne's skull, which had been rescued by the Arundell family, before her death in 1592. 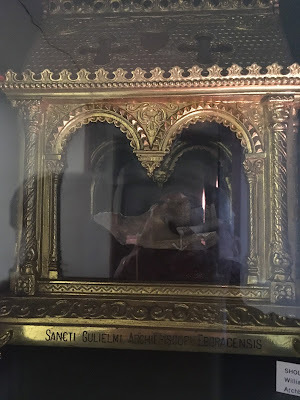 The assumption must be that the other relics were added by other members of the Weston family and hidden by them or priests in the early 17th century during the Catholic ‘penal’ period. 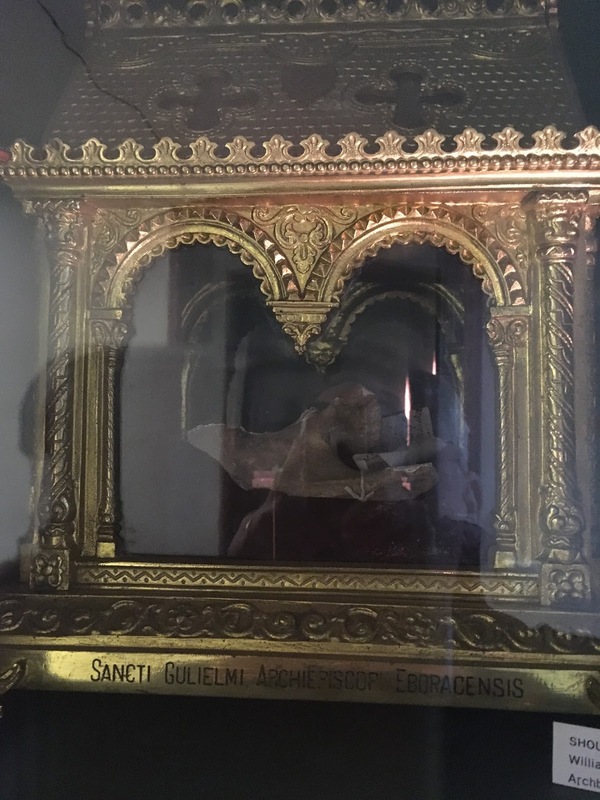 There is also "small relic" of St Edward the Confessor that was given to Hamilton Walter and Aida Harriet Yeats [no, I don't know who they were] by Pope Leo XIII when they married in 1893. A relative later gave it to the church. Its provenance must be questionable. The bust reliquary was made by Duncan Brown in 1998. As well as the relic lockets, a Book of Hours and other items, there is a cambric (fabric) wrist frill that may (or may not) have been worn by St Thomas More, chancellor to Henry VIII but beheaded at the Tower of London in 1535 for treason (and defying King Henry). I wonder how many other relics of medieval saints survived destruction like those of St William of York and SS Edward the Confessor and Wite (also known as St Candida). I haven’t been able to find a register or catalogue. Any advice welcomed. Brian Taylor, A Closer Look at St Edward’s Sutton Park (Margate: Nordic Press, 2014).